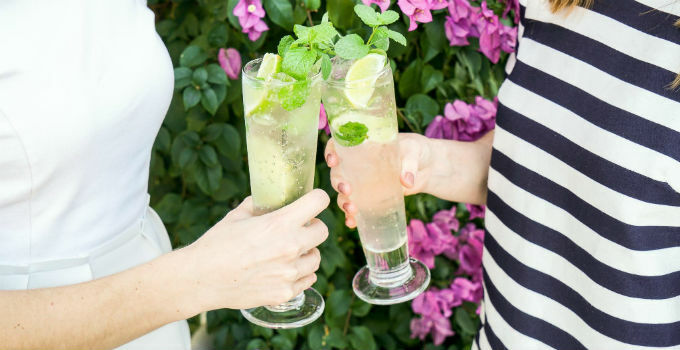 Summer is well and truly here, and there’s no better way to beat the heat than a sneaky tipple or three. And the hotter it gets the earlier the need for something cold, crisp and just a little boozy begins, and before you know it you’re craving a mojito before the sun even starts to set. Whether it’s a Sunday sesh, after-work knock-offs or a lazy Saturday afternoon, these bars have the sunshine and the spritz to make them the perfect spot for a little drinking in the sun. A historic pub in the Valley might not be the place you’d expect to find a fairy lit garden bar, but The Wickham has changed since last century people. Out in their courtyard you’ll find a quirky rustic setting under the sky, with enough greenery to make those fruity cocktail jugs and ploughmans’ boards feel like a garden party. If you’re in serious need of some vitamin D, then snag yourself a daybed in Regatta Hotel’s courtyard and settle in for a day of drinking Pimm’s jugs, nibbling on cheese and crackers and getting yourself a tan – sans salt-water hair and sand in your underwear. Not really the sporting type? Not to worry, there’s plenty to do at Victoria Park that won’t leave you sweating up a storm. Namely: drinking. Head to the Orchard Bar and secure yourself a glass of red or white, or indulge in a classic cocktail and you’ve got yourself a pretty sporting afternoon. Featuring vividly-coloured and retro-inspired spaces and a tropical-themed terrace space, Fitz & Potts are making sure that the day drinking plans of those on the north side never have to go south. With a rotating selection of tap beers and a healthy supply of limited edition brews in the fridge, you’ll be convinced you’re on a tropical getaway. Day drinking doesn’t always have to mean a beer in one hand and an imminent hangover in the other. It can also mean an Aperol spritz in one hand and a handful of zucchini chips in the other. Do we even need to mention the river views you’ll be taking in from the deck? If you need a little something to distract you from the fact that it’s not 5pm yet and you’re already a little boozed, the sight of the city skyline from Stoke Bar’s riverside deck might help. That and a plate of their crunchy parmesan sticks with malt beer cheese sauce to pair with your glass of wine. Perched on the end of James Street and with plenty of greenery, astroturf, and drinking food, you’ll feel right at home soaking up the daylight and the drinks at At Sixes and Sevens. Serving up beer, wine and their signature cocktails (for solo drinking or to share) from 11am every day, you’ll be unable to tell your 6pms from your 7ams when it’s finally time to head home. Forget drinking by the water, at Tide Wine Bar you’re practically drinking ON the water. From this bayside perch, you could only get closer to the ocean by actually jumping in – making it the ultimate spot to soak up some sea breezes and sip on rosé.